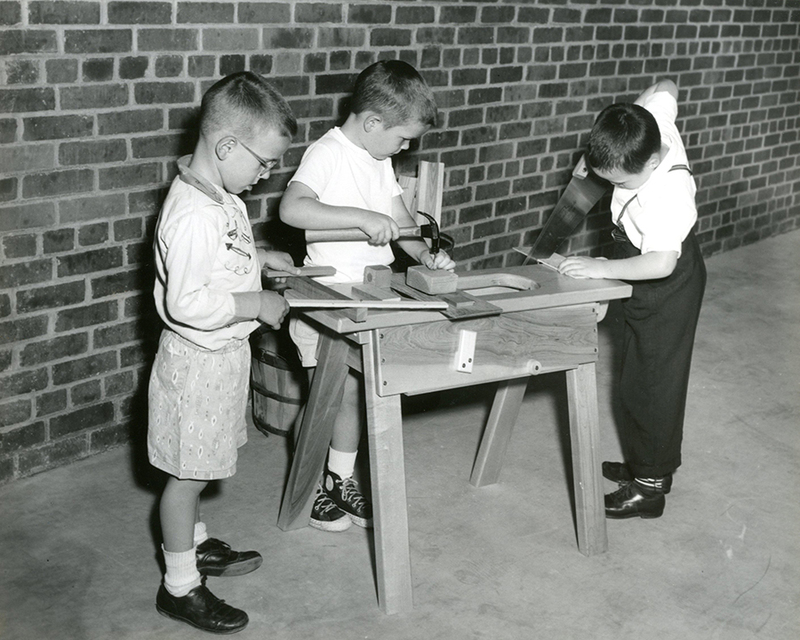 Three young boys stand around a sawhorse using hammer and saw at the Josephine Newbury Demonstration Kindergarten, Richmond, VA.
Before the Newbury Center opened in 1957, there was no education available in a school setting in Richmond or the surrounding counties for children younger than five. Preschool itself was an innovative concept then. This new purpose-built facility was created to become a model preschool for the training of teachers and the design of innovative curriculum. Professor Josephine Newbury of the Presbyterian School of Christian Education, Richmond, Va., established the school. The professional images in this collection are the work of the Dementi Studios, one of Richmond's foremost portrait and documentary photographers. The series was made shortly after the Demonstration Kindergarten opened in 1957. They present an idealized image of childhood experience, social expectations, and gender roles, as well as the educational philosophy and methods of the time. Dementi Studios, Richmond, Va., “Boys using carpentry tools, Josephine Newbury Demonstration Kindergarten, Richmond, Va.,” Social Welfare History Image Portal, accessed April 26, 2019, https://images.socialwelfare.library.vcu.edu/items/show/221.